Last week was a busy one in terms of doing-things-other-than-writing, but it gave me plenty of material to write about now that things have calmed down for a bit. 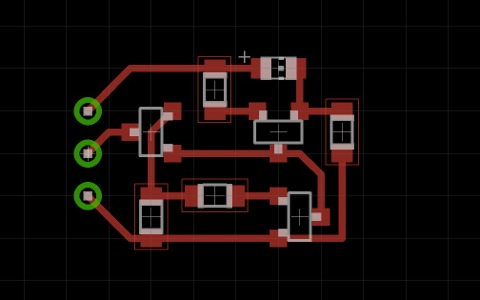 One set of jobs on the list was getting more SMT circuits converted to Eagle and laid out for testing. As I was working on the one below (a current source), I remembered the idea expressed in a previous post and decided to share some more "getting from here to there" with you. I feel like I'm cheating a bit. I didn't think to start taking screen captures until fairly late in the process, so even the first image above is fairly pretty compared to where I started. 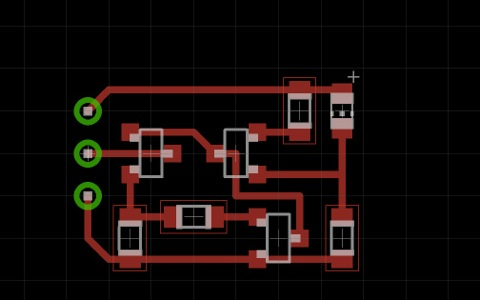 It's a truism of electronics that the pins of an IC are almost never where you want them. 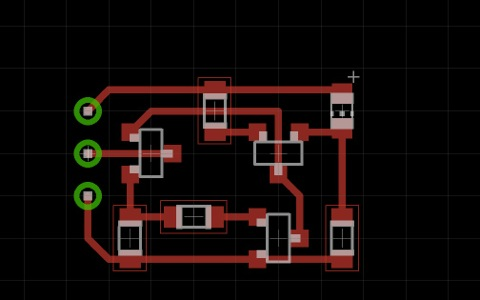 IC designers have their own layout problems to deal with, plus the challenge of choosing inputs and outputs that make sense for the most affordable pin budget. Still, every board layout involves a certain amount of gymnastics just getting connections to the appropriate pins. 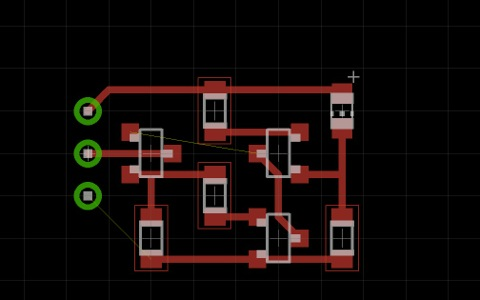 The problem isn't quite as bad when you're dealing with through-hole components. 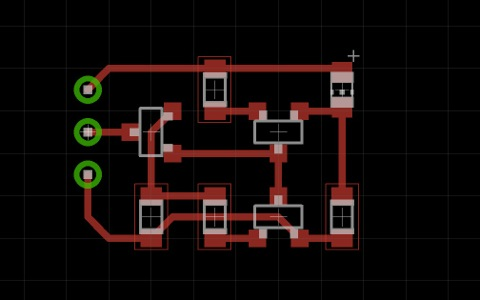 There's enough space between the pins that it's easy to run a trace between them, and possible to run two if you're careful. 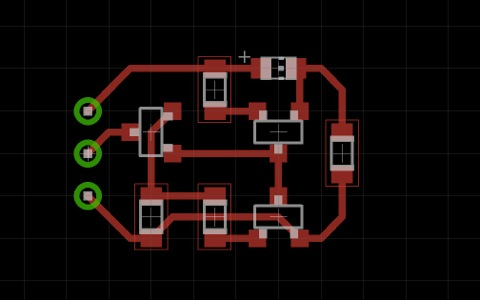 You can do that with SMT layouts too, as you can see above, but only for the devices with the largest spacing between pads. 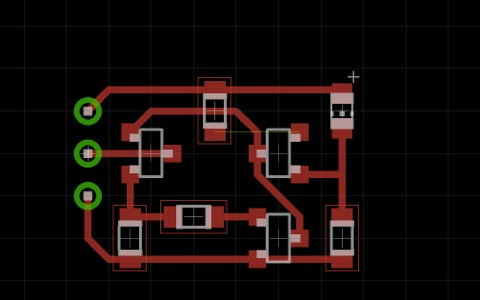 Once you get below 40 pins per inch, just getting traces to the pins becomes a challenge. 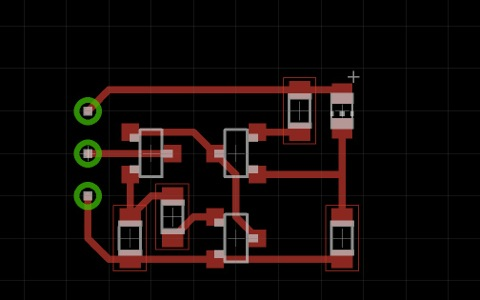 The standard solution for routing problems is to add more layers of copper. 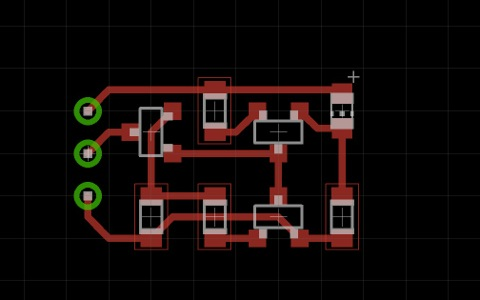 Professional board designers probably feel handcuffed if they don't have separate layers for power and ground, plus at least two layers for the actual signals. 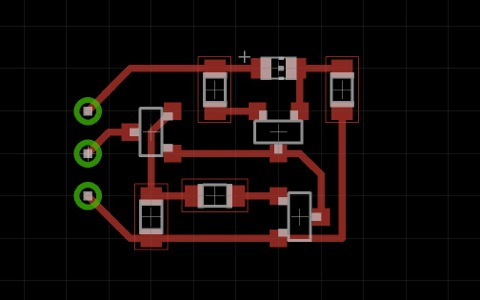 Add the space and pin placement constraints of surface mount components, and SMT really encourages you to use plated through-holes, aka: vias. 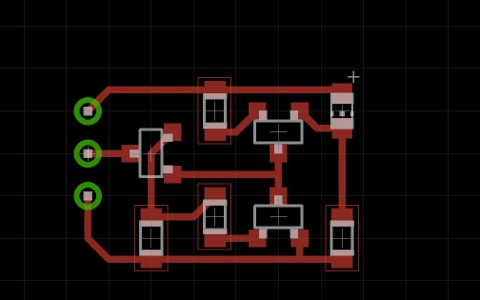 Unfortunately, vias are just about the opposite of DIY friendly. The 'easy' way to get signals through a board is to drill a hole, stick a wire through, and solder it on both sides. You can also use specially made staples, collars, or rivets. The advanced-amateur version involves drilling holes, filling them with conductive ink, then plating copper on top of the ink. Professional board houses plate the holes as well, but use an initial conductive layer that contains palladium and/or platinum. All the options are labor-intensive, and the industry standards are expensive. I have my own variation on the "stick a wire through and solder" technique, which is material for a future post. 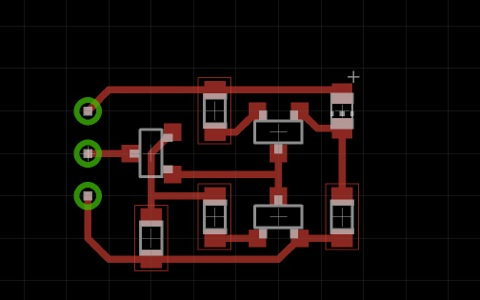 For now, my solution is "just stick to a single layer of copper." 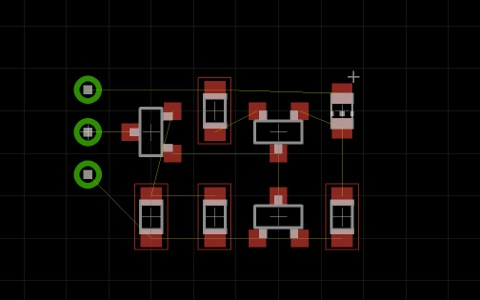 When you accept that constraint, you have to spend a lot of time staring at the parts and moving them around to get a feel for where they need to go. 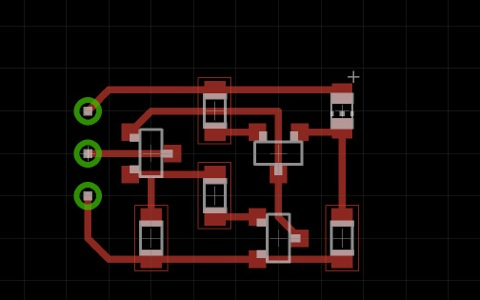 The early versions of this board had parts all over the place, and it took me a while to get down to using a single jumper. 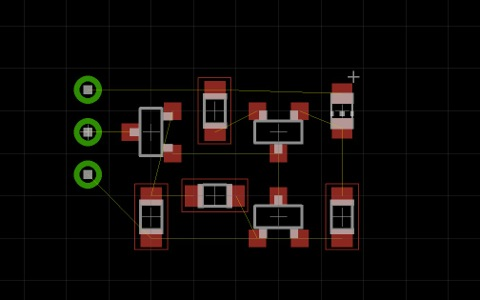 Last week I found a layout that didn't require any jumpers. 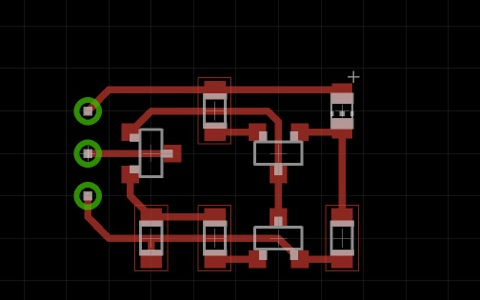 The first board in this series is a zero-jumper layout that was small enough to consider as a candidate for publication. 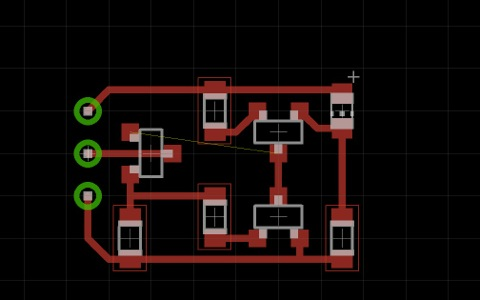 Most of the twiddling involves trying to make the layout smaller or reduce the number of traces that have to run beneath some other part. Additional constraints include keeping the parts on a .05" grid with at least .15" spacing between part centers, and keeping traces on a .025" grid. I work tighter than that for boards I use personally, but these are "getting started with SMT" projects. 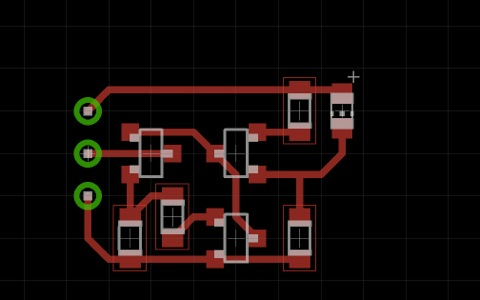 When you're still learning to handle 0805 components, it helps to have room for the tweezers. 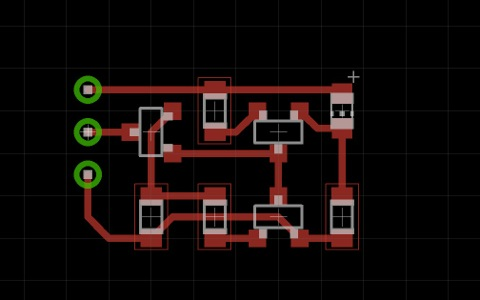 Next time I start a new layout, I'll try to make a point of doing screen captures right from the start, so everyone can see how much time and effort I waste figuring out where the parts want to live. Real Time, adj. : Here and now, as opposed to fake time, which only occurs there and then.